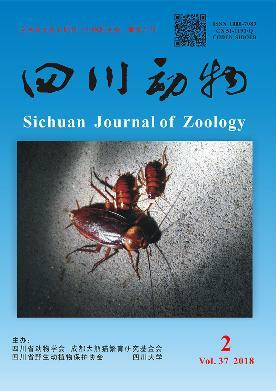 英文摘要：Chemical senses play a critical role in the ecology and behavior of lizards. However, evidence of prey chemical discrimination in the Turpan wonder gecko, Teratoscincus roborowskii, a rare frugivorous gecko endemic to China, is not clear. In this study, the lingual responses of this gecko to single representatives of 3 major categories of food chemicals were investigated. Saturated sugar solution was used as a carbohydrate, pure pork fat as a lipids mixture and soy protein powder solution as a protein. In addition, distilled water was used as control. All stimuli were presented on cotton swabs in 60-sec tongue-flicks trials. Tongue-flicks rate (TFR) and tongue-flicks attack scores[TFAS(R)] were used to determine the chemical identification modes on different stimuli. Our results showed that the T. roborowskii would respond to all 3 stimuli. The TFR value in reponse to the distilled water and the saturated sugar solution were extremely significantly or significantly greater than that to lipids, while the TFAS(R) in response to lipids was extremely significantly higher than that to distilled water and saturated sugar solution. These findings indicated that T. roborowskii is capable of using vomeronasal organ to detect and identify several types of food chemicals. 陈海峰. 2017. 红脂大小蠹基于近交避免行为的雄性配偶选择研究[J]. 四川动物, 36(3):271-276. 蒋洁, 武正军, 于海, 等. 2009. 鳄蜥的食物识别机制[J]. 动物学研究, 30(5):553-558. 李文蓉, 宋玉成, 时磊. 2010. 基于骨龄学方法鉴定吐鲁番沙虎的年龄[J]. 动物学杂志, 45(3):79-86. 李文蓉, 宋玉成, 时磊. 2013. 性别、季节及体型大小对吐鲁番沙虎巢域的影响[J]. 生态学报, 33(2):395-401. 林英英, 肖丽蓉, 马晓燕, 等. 2016. 吐鲁番沙虎消化道对刺山柑种子吸水和萌发的影响[J]. 草业科学, 33(9):1764-1769. 刘洋, 宋玉成, 李文蓉, 等. 2010. 吐鲁番沙虎头、体大小的两性异型及其食性的季节性变化[J]. 生态学杂志, 29(2):333-338. 时磊, 周永恒, 原洪. 2002. 新疆维吾尔自治区爬行动物区系与地理区划[J]. 四川动物, 21(3):152-157. 宋玉成, 赵蕙, 时磊. 2009. 吐鲁番沙虎的日活动节律及其影响因子分析[J]. 新疆农业大学学报, 32(1):22-35. 汪波, 黄婷, 韩梦, 等. 2014. 狼蛛的化学感受器在寻觅定位猎物中的作用研究[J]. 四川动物, 33(1):86-89. Aragon P, Lopez P, Martin J. 2001. Chemosensory discrimination of familiar and unfamiliar conspecifics by lizards:implications of field spatial relationships between males[J]. Behavioral Ecology and Sociobiology, 50(2):128-133. Auffenberg W. 1984. Notes on the feeding behaviour of Varanus bengalensis (Sauria:Varanidae)[J]. Journal of the Bombay Natural History Society, 80(2):286-302. Autumn K, Han B. 1989. Mimicry of scorpions by juvenile lizards,Teratoscincus roborowskii (Gekkonidae)[J]. Chinese Herpetological Research, 2(2):60-64. Baeckens S, Huyghe K, Palme R, et al. 2017. Chemical communication in the lacertid lizard Podarcis muralis:the functional significance of testosterone[J]. Acta Zoologica, 98(1):94-103. Besson AA, Thierry A, Boros E, et al. 2009. Evidence of food chemical discrimination in tuatara (O. rhynchocephalia):comparison with a gekkotan lizard (O. squamata)[J]. Journal of Herpetology, 43(1):124-131. Cabido C, Gonzalo A, Galan P, et al. 2004. Chemosensory predator recognition induces defensive behavior in the slow-worm (Anguis fragilis)[J]. Canadian Journal of Zoology, 82(3):510-515.
Cooper WE, Alberts AC. 1991. Tongue-flicking and biting in response to chemical food stimuli by an iguanid lizard (Dipsosaurus dorsalis) having sealed vomeronasal ducts:vomerolfaction may mediate these behavioral responses[J]. Journal of Chemical Ecology, 17(1):135-146.
Cooper WE, Burghardt G. 1990. A comparative analysis of scoring methods for squamate prey odor discrimination data[J]. Journal of Chemical Ecology, 16(1):45-65.
Cooper WE, Ferguson GW, Habegger JJ. 2001. Responses to animal and plant chemicals by several iguanian insectivores and the tuatara, Sphenodon punctatus[J]. Journal of Herpetology, 35(2):255-263.
Cooper WE, Pérez-Mellado V, Vitt LJ. 2002. Responses to major categories of food chemicals by the lizard Podarcis lilfordi[J]. Journal of Chemical Ecology, 28(4):709-720.
Cooper WE, Pérez-Mellado V. 2001. Chemosensory responses to sugar and fat by the omnivorous lizard Gallotia caesaris with behavioral evidence suggesting a role for gustation[J]. Physiology and Behavior, 73(4):509-516.
Cooper WE, Pérez-Mellado V. 2002. Responses by a generalist predator, the Balearic lizard Podarcis lilfordi, to chemical cues from taxonomically diverse prey[J]. Acta Ethologica, 4(1):119-124.
Cooper WE, Whiting MJ. 1999. Foraging modes in lacertid lizard from southern Africa[J]. Amphibia-Reptilia, 20(3):299-311.
Cooper WE. 1995. Foraging mode, prey chemical discrimination, and phylogeny in lizards[J]. Animal Behavior, 50(4):973-985.
Cooper WE. 1997. Correlated evolution of prey chemical discrimination with foraging, lingual morphology and vomeronasal chemoreceptor abundance in lizards[J]. Behavioral Ecology and Sociobiology, 41(4):257-265.
Cooper WE. 1998. Prey chemical discrimination indicated by tongue-flicking in the eublepharid gecko Coleonyx variegatus[J]. Journal of Experimental Zoology, 281(1):21-25.
Cooper WE. 1999. Prey chemical discrimination in ambush foragers:absence in representatives of two additional iguanian lizard families and probable olfactory mediation in a gekkonine gecko[J]. Chemoecology, 9(4):155-159.
Cooper WE. 2007. Lizard chemical senses, chemosensory behavior, and foraging mode[M]//Reilly S, McBrayer L, Miles D. Lizard ecology. Cambridge:Cambridge University Press:237-270. Daghfous G, Smargiassi M, Libourel PA, et al. 2012. The function of oscillatory tongue-fflicks in snakes:insights from kinematics of tongue-fflicking in the banded water snake (Nerodia fasciata)[J]. Chemical Senses, 37(9):883-896. Dial BE, Schwenk K. 1996. Olfaction and predator detection in Coleonyx brevis (Squamata:Eublepharidae), with comments on the functional significance of buccal pulsing in geckos[J]. Journal of Experimental Zoology, 276(6):415-424. Filoramo NI, Schwenk K. 2009. Mechanism of chemical delivery to the vomeronasal organs in squamate reptiles:a comparative morphological approach[J]. Journal of Experimental Zoology Part A:Ecological Genetics and Physiology, 311(1):20-34. Halpern M, Frumin N. 1979. Roles of the vomeronasal and olfactory systems in prey attack and feeding in adult garter snakes[J]. Physiology & Behavior, 22(6):1183-1189. Halpern M. 1992. Nasal chemical senses in reptiles:structure and function[M]//Gans C, Crews D. Biology of the Reptilia. Chicago:University of Chicago:423-523. Labra A, Beltran S, Niemeyer HM. 2001. Chemical exploratory behavior in the lizard Liolaemus bellii[J]. Journal of Herpetology, 35(1):51-55. Macey JR, Ananjeva NB, Wang Y, et al. 1997. A taxonomic reevaluation of the gennkonid lizard genus Teratoscincus in China[J]. Russian Journal of Herpetology, 4(1):8-16. Nevo O, Heymann EW, Schulz S, et al. 2016. Fruit odor as a ripeness signal for seed-dispersing primates? A case study on four Neotropical plant species[J]. Journal of Chemical Ecology, 42(4):323-328. Olsson M, Madsen T, Nordby J, et al. 2003. Major histocompatibility complex and mate choice in sand lizards[J]. Proceedings of the Royal Society B:Biological Sciences, 270(2):254-256. Song YC, Liu Y, Lin YY, et al. 2017. Burrow characteristics and microhabitat use of the Turpan wonder gecko Teratoscincus roborowskii (Squamata, Gekkonidae)[J]. Asian Herpetological Research, 8(1):61-69. Webb JK, Du WG, Pike DA, et al. 2009. Chemical cues from both dangerous and nondangerous snakes elicit antipredator behaviours from a nocturnal lizard[J]. Animal Behaviour, 77(6):1471-1478. Werner YL, Okada S, Ota H, et al. 1997. Varied and fluctuating foraging modes in nocturnal lizards of the family Gekkonidae[J]. Asiatic Herpetological Research, 7:153-165.